Permafrost is perennially frozen ground. More specifically, the International Permafrost Association defines permafrost as ground that maintains a temperature at or below 0°C for at least 2 years. Frozen water need not be present for soils or rocks to meet this definition. For practical (engineering) purposes and in the context of cryospheric science, however, it is the ice content of permafrost that is of interest. This requires slight modifications to the formal definition, as we are primarily concerned with whether or not water in the pore space of soils and rock will be in the liquid or solid phase. 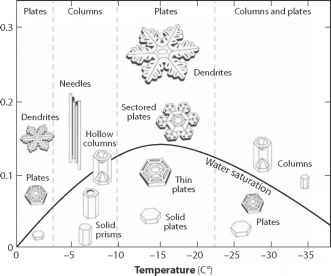 This depends on the local pressure melting point and the salinity of the pore fluid. As discussed in chapter 2, overburden pressure depresses the freezing point of pure water by 0.074°C MPa-1, giving a freezing point of about -2°C under 1 km of sediments. In marine environments, pressure melting point and salinity effects are both relevant. The latter dominate on continental shelves, where typical ocean salinities give a freezing point of -1.8°C. Marine sediments with seawa-ter in the pore space need to dip below this temperature to create permafrost. In deep waters (most of the world's oceans), pressure effects require temperatures below -3°C to support permafrost. Water temperatures this cold are not found in the modern ocean, so marine permafrost is only viable in cold, continental shelf environments. These are found in high-latitude continental shelves that were exposed to the atmosphere due to lower sea levels during the Pleistocene glaciations. Once frozen, salt rejection creates low-salinity ice in the sediments, with a melting point closer to 0°C; this helps to preserve frozen ground on continental shelves of the Arctic basin, as they typically see ocean temperatures below this. About 58% of the Northern Hemisphere land mass, an area of 55 x 106 km2, experiences seasonally frozen ground. This thaws in the spring and summer in much of this area, but perennially frozen ground—permafrost—covers 23 x 106 km2, or about 24% of the land in the Northern Hemisphere. Almost half of this is present as continuous permafrost in the high latitudes of Russia, Canada, and Alaska (figure 7.1), defined as areas with permafrost covering more than 90% of the landscape. South of this one encounters zones of discontinuous (50% to 90%) and sporadic (<50%) permafrost. Pockets of alpine permafrost are also present in most mountain ranges, and additional, generally unmapped areas of perennially frozen ground occur under glaciers and ice sheets at high latitudes. Permafrost is rare in the Southern Hemisphere, because the only place sufficiently cold—Antarctica—is mostly ice covered. About 0.3% of Antarctica is free of glacial cover, much of this in the Dry Valleys. This entire area contains permafrost. An unknown but potentially large area of frozen ground underlies cold-based sectors of the Antarctic ice sheet. Permafrost is also found on the Antarctic islands and at high elevations in the Andes. Figure 7.1. 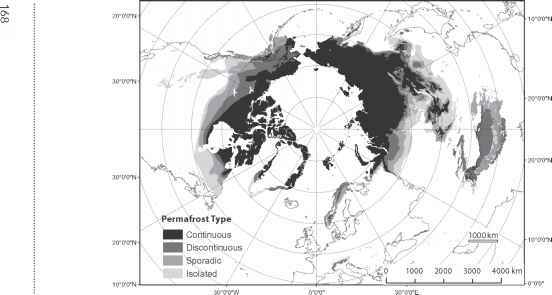 Permafrost distribution in the northern hemisphere, based on the data compilation by Brown et al. (1998, updated 2001), available from the U.S. National Snow and Ice Data Center. formed during the Pleistocene glaciations, when global sea level was drawn down more than 100 m due to the buildup of ice sheets on land. This exposed large areas of continental shelf around the world, and permafrost had thousands of years to develop in these exposed-shelf environments fringing the Arctic Ocean, such as the Bering Sea. Much of the Earth's frozen ground formed during the Quaternary glacial periods and has persisted to this day. Relict permafrost features can be found at lower latitudes and in mountain regions, where a relatively thin layer of frozen ground developed at these locations during the glaciation but has since thawed. This helps to demarcate the proglacial zone of the last great ice sheets. Subsea permafrost is more than 100 m thick in places. In general, permafrost thickness ranges from decimeters to more than 1000 m, with the deepest permafrost found in parts of Siberia, Alaska, and northwestern Canada that eluded glacier ice for much of the last glaciation. The greatest known depth of permafrost is 1500 m, found near the Lena River in Siberia. Where ice sheets persisted for extended periods they insulated the ground from cold air temperatures, moderating the mean annual temperature and limiting permafrost growth.